"It's like an Easy Bake Oven for Mommies!" 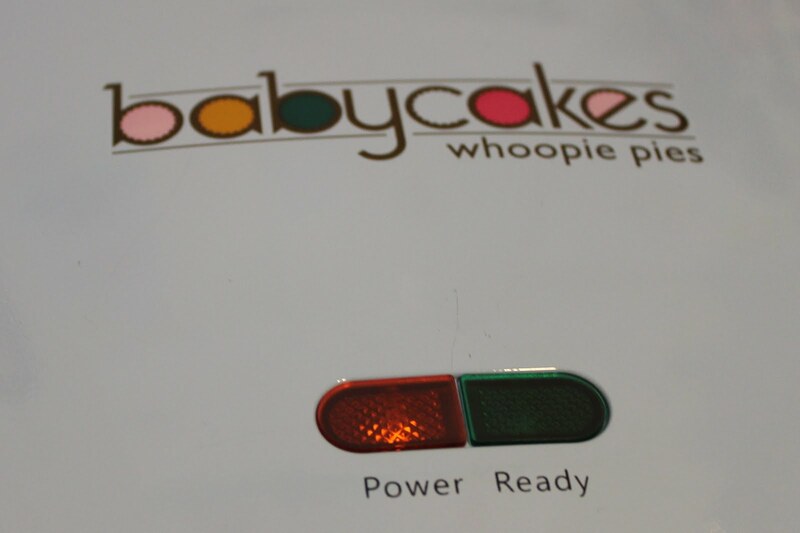 According to Natalia, the Babycakes Whoopie Pie Maker is an advanced Easy Bake Oven for Mommies. She's actually correct in her assessment of this easy to use toy. This weekend the minnies and I were at Wegmans and saw the Babycakes Whoopie Pie Maker. It looked like a lot of fun, so I purchased it on a whim. I think I must have been hungry or something because I don't normally buy things like this, but I'm thrilled with the purchase and plan to use it often. The whoopie pie maker only needs to preheat for a minute or so and it is ready to use. The instructions say to preheat while you are making the mix, but I found that it gets too hot if you do this. You’ll get better results if you preheat just before you need to bake. Just wait for the little green light, and you're ready to go. The whoopie pie maker is easy to use right out of the box and has all of the tools you will need. 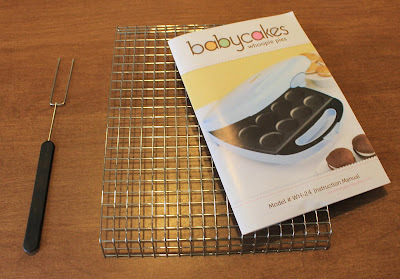 It comes with a cooling rack and little two prong fork to help remove the baked whoopie pies. There's even a recipe book with different types of whoopie pie cakes and icing. 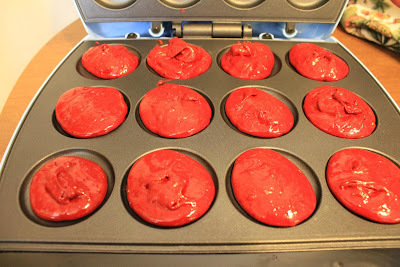 Since this was our first attempt and somewhat of a fun experiment, I just used a regular cake mix for the whoopie pies. 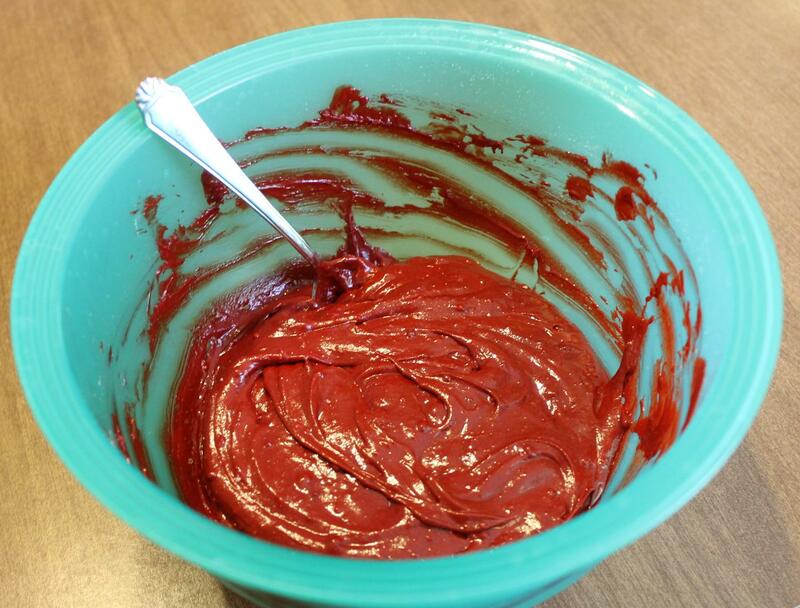 Here’s what I had in the mix: 2 cups of red velvet cake mix, 4 tablespoons of butter, 1 egg, and ½ cup of water. It’s so easy to make, that I mixed it by hand. Once you have your whoopie pie batter mixed, you’ll need to work quickly. This was the only challenging part of the process. 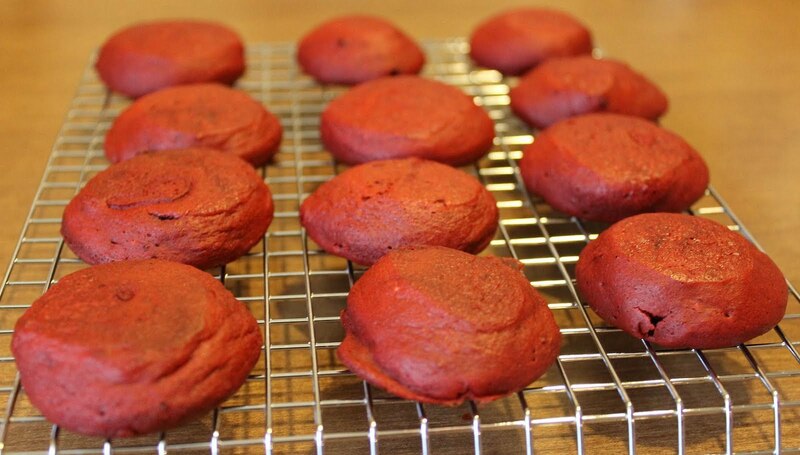 Since the whoopie pies cook so quickly, it’s important to get the batter in each little space in a relatively short period of time so that your first little pies don’t burn. The instructions said to use about a spoonful of batter. This is about right, but basically you need to fill the bottom space entirely to get good results. For the last batch, I actually squeezed the batter on the griddle using a pastry bag. It was lightning fast and none of the little whoopie pies burned. Play with the baking times a little bit. Again, since these bake so quickly, it is best to be ready and organized. I set a timer for two and a half minutes, but the whoopie pies were a little too brown for my liking. For the next batch, I shortened the time to two minutes. Just right. We also tried a batch at a little bit less than two minutes, but the texture was too spongey and not firm like a whoopie pie. 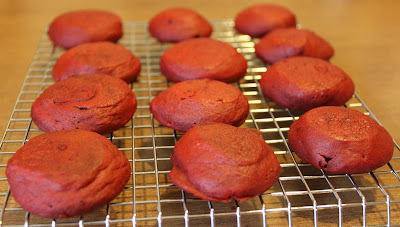 By the way, you'll have a lot of whoopie pies from the recipe I posted. We had 3 batches of 12 individual pieces...that's 18 whoopie pies in less than 20 minutes from start to finish, including mixing and icing. It's easy to make many different flavors of whoopie pie because the process to make them is so fast. Here are the delicious whoopie pies we made! The possibilities with this are endless. The whoopie pie maker also works well to make silver dollar sized pancakes using regular pancake batter. Mini whoopie pies would be adorable on a candy buffet or as a little treat at a baby shower. Later this week, I'll share a family secret with you. My mother is going to share my Aunt Jan's semi-famous and very delicious homemade recipe for Pennsylvania Dutch whoopie pies and icing. This looks so fun! I saw the cake pop maker and was tempted to get that. Love it! I need to get one next time I go grocery shopping. My kids will absolutely love it. It's so delicious! I saw the cake pop maker, too, but am not sure that it would taste like a "real" cake pop since it would be all cake and no icing mixed in the ball. Those look so good. I mentioned I would like the baby cakes donut maker over Christmas but it wasn't under the tree. Now I'm hungry! Looks delicious! Too cute, as well. There is absolutely nothing better than red velvet - plus it's perfect for Valentines day. I need to try this. Fun! I saw the baker and wondered if it would be worth it. My kids would love to make those!!! Yum-- so cute!! 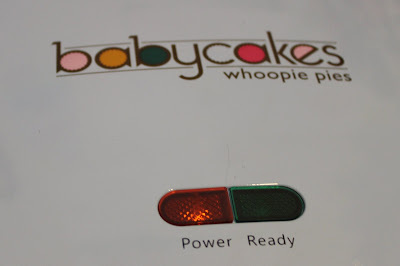 I got the BabyCakes Pie Pop Maker for Christmas and LOVE it! You are right though about working quickly, that's the one challenging part! I'd never had homemade whoopie pies before this past weekend. A friend made pumpkin ones I they were so yummy! I can imagine red velvet are even better! How cute! I can absolutely see the Easy Bake reference, but how fun! 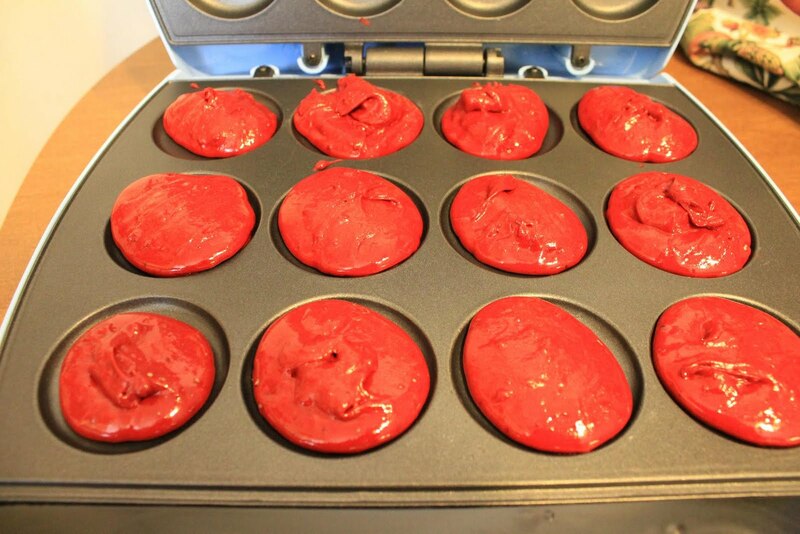 My daughter actually made red velvet cupcakes in her EBO from Christmas and they were the size of quarters. She would be all over this! It is fun to make them for my KinderGators, they are just the perfect size! Thanks for all of the sweet comments. These are so delicious and so easy to make. Mrs. K ~ My girls think that they are the perfect size for their classmates for a Valentine's Day Party and I have to agree with them.